Introducing the best corn pudding in town. 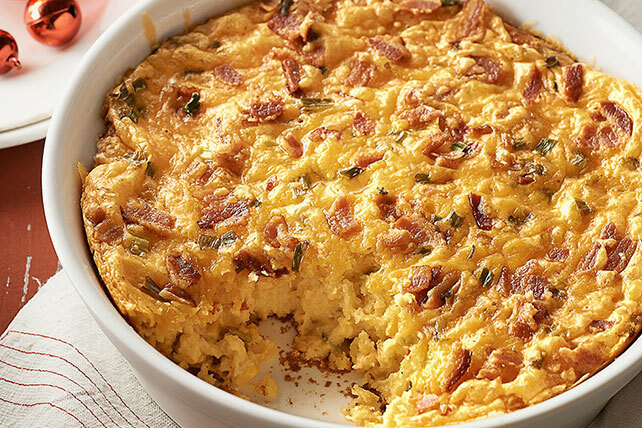 With ranch dressing, cheddar cheese and bacon, it’ll be a crowd favorite at your next brunch. Mix first 5 ingredients until blended; stir in 1/2 cup cheese. Pour into 2-qt. casserole sprayed with cooking spray. Bake 40 min. Meanwhile, combine bacon, onions and remaining cheese. Top casserole with bacon mixture; bake 15 min. or until lightly browned. Since this delicious corn casserole serves 12, it's the perfect dish to serve at your next brunch. Bake in 13x9-inch pan sprayed with cooking spray 20 min. Top with cheese mixture; bake 15 min. or until lightly browned. Add 1/4 tsp. ground red pepper (cayenne) when mixing first 5 ingredients; bake as directed.